Excellent, if not one of the best documentary style movies of all time, as told from both sides, of the event that plunged the United States into the Second World War. This movie reigns supreme over it's 2001 version Pearl Harbor which is really a fictional love story confined within a true conflict. 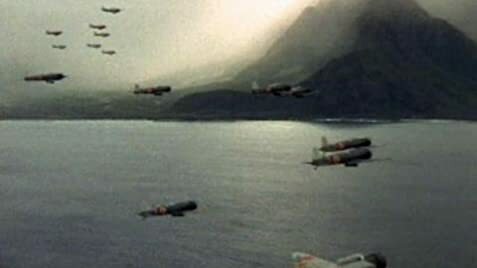 Tora Tora Tora is based on actual events leading up to this avoidable tragedy, notably the bureaucratic bungling and complacency from the top down which allowed the Japanese attack to succeed. Throughout this well done production, the story in true chronological sequence shifts between the two opposing sides with full subtitles giving the role played by each leading actor. The viewer is given a clear concise unfolding of events with the part of the code-breakers importantly emphasized. The attack is quite breathtaking in parts with several scenes closely resembling or being actual footage taken. Ironically the breaking of the Japanese naval code by U.S. Intelligence gave the Americans every opportunity to correctly contemplate the next move of their adversary, but a desire for utmost secrecy by the Roosevelt Administration and the top brass of the Navy and Army restricted the transmission of clear and proper communications necessary for the Pearl Harbor commanders, Admiral Kimmel and General Short to make sound objective judgments regarding their respective commands. Both men were treated shabbily by their superiors in the aftermath of the attack, were relieved of their command, and for decades thereafter had to endure the shame and responsibility placed on them in allowing this occurrence to happen. This movie does a lot to exonerate them from their part in this terrible disaster. P.S. I had the great honor of meeting bugler Richard Fiske personally, (USS West Virginia) with a colleague of mine when we visited Pearl Harbor in March 1997, (plus autograph),and had our photo taken with him. It is one of my enduring photos of this great sailor who gave his time unselfishly as a volunteer survivor, at the base, to give two second generation Australians the respect of knowing that we met a man who belonged to a nation which contributed to the success of winning the Pacific War. The original draft of the combined script contained six hundred fifty-seven pages. Commander Minoru Genda: Everything is strangely quiet. The American anti-aircraft batteries haven't fired a shot! And no enemy fighters over the harbor, sir! We've done it! Send the message: "Tora! Tora! Tora!" Commander Genda's Co-Pilot: And no enemy fighters over the harbor, sir! Theodore Wilkinson was a Rear Admiral at the time of the Pearl Harbor attack, not a Captain. The 20th Century Fox logo does not appear on this film. The Japanese release runs roughly ten minutes longer and contains two sequences not included in other versions: Admiral Yamamoto visiting the Imperial Palace and talking with Lord Keeper of the Privy Seal Kido, and a comical scene between two cooks about the carrier Akagi that explains how the International Date Line works. Also, for obvious reasons, the Japanese characters' dialogue is not given on-screen English subtitles.